Washington (CNN) - Accused by Democrats and a few of his Republican rivals of taking a low profile on the debt talks between Congressional leaders and the White House, GOP front-runner Mitt Romney has now hit the ceiling. At a town hall meeting in the early voting state of New Hampshire Thursday, the former Massachusetts governor drew a "line in the sand," saying nothing short of the "Cut, Cap, and Balance" plan proposed by several conservative Republicans is acceptable as a condition for raising the debt ceiling. "The president needs to agree to cut federal spending, cap federal spending and pursue a balanced budget amendment. That is the answer for the debt limit. 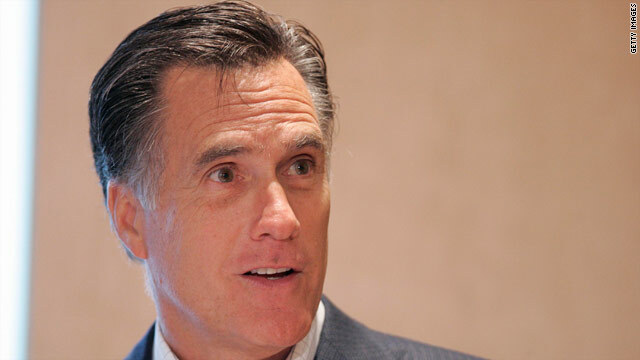 It's the answer for the country," Romney said, citing the general outline of the "Cut, Cap, and Balance" proposal. "That is the line in the sand." Nearly all of the declared and potential Republican candidates are ratcheting up the rhetoric on the issue. Former Alaska Governor Sarah Palin returned to one of her controversial catch-phrases in an interview on the subject on Fox News. "We cannot default but we cannot afford to retreat either. Now is not the time to retreat. It's the time to reload and we reload with reality," Palin said. Texas Congressman Ron Paul released a new TV ad that warns past budget compromises with Democrats have only led to higher taxes. "The 90's brought more compromises. More broken promises. And more taxes," the ad says. The ad fails to mention President Bill Clinton balanced the budget in the late 1990's after raising taxes. At a press conference on Capitol Hill Wednesday, Minnesota Rep. Michele Bachmann accused the President and even the Treasury Secretary of passing on to the American people what she described as a "misnomer." "And it's this: that if Congress fails to raise the debt ceiling by 2.5 trillion dollars that somehow the United States will go into default and we will lose the full faith and credit of the United States. That is simply not true," Bachmann said. The Minnesota Congresswoman opposes raising the debt ceiling. Hours after her comments, the powerful Moody's investors' service announced it was reviewing the AAA bond rating for the United States. For voters it's a question of who do you trust. Bachmann or Ben Bernanke? The Federal Reserve Chairman was far from subtle when asked at a Congressional hearing Thursday about the consequences of missing the August 2 deadline for raising the debt ceiling. "I think it would be a calamitous outcome," Bernanke said. Raising taxes is out of the question for nearly every Republican in the presidential field. All except one candidate have signed a prominent pledge not to raise taxes. "Huntsman isn't signing any (pledges)," Huntsman spokesman Tim Miller said. "We remain hopeful he will eventually sign," ATR spokesman John Kartch said. Any Republican accused of playing politics with the issue can point to President Obama who voted against hiking the debt ceiling in 2006. It's a vote the President says he now regrets. "That was just an example of a new senator making what is a political vote as opposed to what was important for the country," President Obama told ABC News in April. Besides Representatives Bachmann, Paul and Michigan Rep. Thad McCotter, the rest of the GOP presidential candidates don't have to cast a vote on the debt ceiling. That's a luxury a lot of politicians in Washington wish they had. all these repugs talk about is higher taxes, how they surviving in the reagan bush and clinton eras. if obama went back to the reagan error of taxes these repugs would have flip their minds. even Reagan new that tax cuts is a prelim to disaster. he had to raise it 11 times in a hurry. when taxes are higher the money stays in the country and circulate. when tax cut are given to the rich the money end up in china, as the rich are bent on pushing china into a super power and watch us go down the drain in the name of lower labor force. no wonder why they are doing their best to get rid of the middle class. this country is about demand, since 75% of our economy is consumer spending. why cant the repugs form their lips and utter the word demand. oh i forgot their corporate master dont need little biddy american demand when theyve got 1.5 billion people to tend to. all these corporates need from us is the american brand, when they go to other countries. tax them obama, and keep our money in america. "Cut, Cap, and Balance" proposal. "That is the line in the sand." And it is also evidence that Romney's head is in that sand. It's easy from the sidelines with no control and no possible repercussions to prance around making grandiose claims, etc. Really easy. There (it) goes again being devious. He always takes the easy way out. That way he can continue to keep his hands clean while others in his party bash (he's kept his hands clean ALL his life). I would never vote this thug into office and anyone who does can say good-bye to their job. 10 plus years of tax cuts, no jobs created. Is that all this Idiot can say is – "Reload" ? Half-wit with nothing but a Gun mentality. Who to believe Bachmman the fraud or Bernanke, hmmmmm real tough choice. Looks like Huntsman is going to make up huge ground soon> Just say no to candidates that sign pledges ! Signing that pledge is going to come back and bite really hard on all the candidates that locked themselves up to a cult when the majority of people want candidates that will work with everyone anf for the PEOPLE not the party. Republicans will never win with this pledge and their party first mentallity that comes with signing these pledges.Its about the country and the economy, it is not about your pledge to your party. Read the news and listen to the people, the majority want a tax increase with spending cuts. No surprise that Mittens is just another GOBPbaggin' corrupt corporatism cultist. He only talks about cutting spending (which is NEEDED during down economic times) yet he refuses to discuss raising taxes on corporation and the filthy rich. C'mon, Mittens, what sacrifices are you calling on them to make since the rest of us are making sacrifices. What's that, you don't won't ask those who own the most to make any sacrifices? How un-American of you. I do think we spend to much. Democrats are willing to cut spending on there sacred cows. Republicans are not willing to cut there sacred programs. As a matter of fact they seem to acting as a deer in headlights. ... I would never vote this thug into office and anyone who does can say good-bye to their job. 3 million ( and counting ) jobs have been lost after Obama was elected. He still has another year and a half to probably lose another million American jobs. And you want to vote for more of that kind of performance? With this kind of economic impact and a lower value US dollar, Chinese and Indian companies will be outsourcing jobs back to America for the cheap labor. See? Eventually Obama's policies will result in more American jobs. By then, it will just take a week's pay to fill up your gas tank. I am surprised that Romney would cater to the Teapots – he seemed more reasonable than that. Also he seemed more in touch with recent polls. 67% of Americans think there SHOULD be a tax increase on the rich to help pay for this debt crisis. Yes, we need to cut entitlement, but you gotta close the loopholes, too. And when you make blanket statements like "Cut, Cap, and Balance" and refuse to hear anything else – you align yourself with the likes of Bachmann and the rest of the Tea Party. Go ahead, draw your line in the sand and 'stick to your principles'. just remember – people cant EAT principles. And these people have memories, and they vote. BTW – closing tax loopholes is not the same as raising taxes. Unless you intended to give rich retirees with vacation homes on the Mediterranean tax breaks on purpose. Then yes, it is the same as raising taxes. And dont spew any nonsense about trickedown Reaganomics, cuase those arguements dont hold water. You're pulling in $5Million a year, and who are you hiring (YOU, not your company)? A housekeeper at minimum wage? A few illegal gardeners part time? Spare me! Good ol' Mitt, taking a stand = to the far right that he's never been on until flip-flopping his way into our lives. Get an original opinion Mitt, & then stick with it, please, just one!! And Romney just proved he has the economic knowledge of a gnat; the Cut, Cap and Balance plan is incredibly irresponsible. Bush running a deficit in an economically prosperous time iwas incredibly irresponsible but not being able to run a deficit to overcome unforseen obstacles (such as a disaster, turmoil in another country or a lack of regulations and oversight by Bush that allowed the banks, etc. to bring the country to its knees) is just dumb. So the new Retardlican catch phrase to stimulate their herd of simpletons is now "cut, cap, and balance"!......Yeah. I can see it now.........Cut EVERYTHING concerning the middle class, Cap the amount of taxes those poor little wealthy folks have to pay and balance the books with more borrowed money from a "communist lite" nation like China! What they haven't talked about are what cuts they are planning on making as well as who these cuts will hurt. Many of these people don't identify cuts in defense spending they will do, but are ready to cut social welfare spending. The Republican primaries will be an interesting experience. There's one orthodoxy and a dozen candidates (or near candidates). Does anyone dare think something different from the official party line?! Just when we need leadership, we're getting a collection of cattle, loyally following the herd. Of course Romney doesn't want the rich to pay higher taxes. He's a millionaire. He'd endorsed the rich paying the same percentage in taxes as the middle class about the same time that he encourages one of his 6 sons to go fight for their country. What was the hot rhetoric crap during the last midterm "job-killing policies", "repeal and replace" and now what "Cut, Cap, and Balance" the most interesting issue is that, the Republicans never clarify nor substantiate which Obama policies have killed jobs, never explained what should be repealed and replaced and now they can't tell you how they gonna attain that crap aka cut, cap and balance!!!. Fool me once twice never! let's take for instance, since Republicans’ first priority was to repeal the Affordable Health Care Act, they ratcheted up the notion that the law is a job killer!!. Apparently Boehner and his posse have no concept of time or dates because the law doesn’t fully go into effect until 2014, so how is/was the law a job killer or will add to the deficit is a mystery. It has been implemented yet!!! but most fall for that BS. We need to ask them how are they going to cap, cut and balance and expect a full explanation, but not a song lyric called cap, cut and balance. why didn't any of your five sons do any MILITARY SERVICE ? This is appalling spin and just words. Even then Ryan Budget does not do that i.e cap everything balance the budget. Cut cap and balance everything... Ok genius Romney ihear you Now i need to know precisely how you are going to be able to do that when every economist and th global economy sayy it not doable for the next 4/5 years at least and more than likely 10 -20 you conveniently forget that cut federal spemding, Cap federal spending, balance the budget this latter is key, a balanced budget does not reduce the debt you need a surplus. Ok again Genius business man HOW PLEASE. If your plan includes a global economic recovery outside US that works for any party re debt or deficit reduction. The only way America helps itself is by expanding the Local economy other than via exports.. + where the local extra jobs Jobs in you plan sir ( not the businesses growing via exports) Lower taxes do not stimulate corporate export or Domestic growth the measure as you well know Is EBITDA. A lot of people you need to vote for you are more than well aware of these points. C'mon, Mittens, tell us what sacrifices corporations and filthy rich should be making. You do agree they should sacrifice along with the rest of us, right?